Sunday was another perfect day to get outdoors and enjoy the weather. Georgia and I chose the Milwaukee Zoo for our outing. We had been there before but it was years ago. This seemed like a good day for a return visit. It is a smaller park than Brookfield Zoo here in the Chicago suburbs but it is still an excellent zoo. They have a good collection, the grounds are clean, and the animals all appear to be well cared for. We expected it to be less crowded too but,more people were there than we thought would be. I guess everyone wanted to get outside on such a nice day. 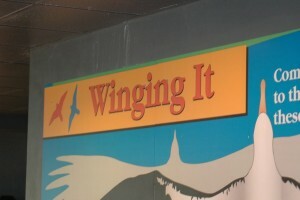 We left home about 10 AM and got to the zoo an 11:30. Georgia is on a special pre-surgery diet so she went into the gift shop while I got a brat for lunch. Then we went outside and started around the grounds. Going to the left from the entrance, the first exhibit was the aviary. Many of the rooms in this building had free flying birds zipping over our heads. Others, like the penguin exhibit, are behind glass. I had to get a picture of this sign of course. The special exhibits building is hosting a butterfly exhibit this year so we went there next. 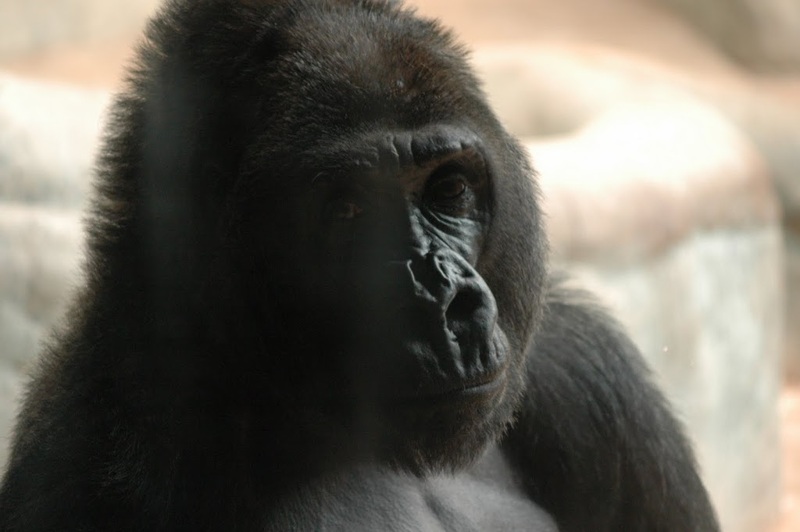 Then is was on to the ape house where we got up close with gorillas, orangutans, bonobos and other apes and monkeys. It is always fun to watch their antics. Everyone likes the apes and this was one of the most crowded exhibit areas. 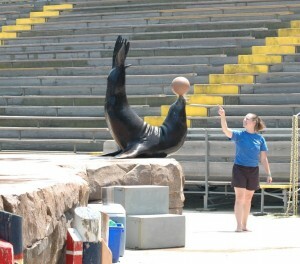 We wanted to see the sea lion show at 1:30 PM so went over to the show stands next. 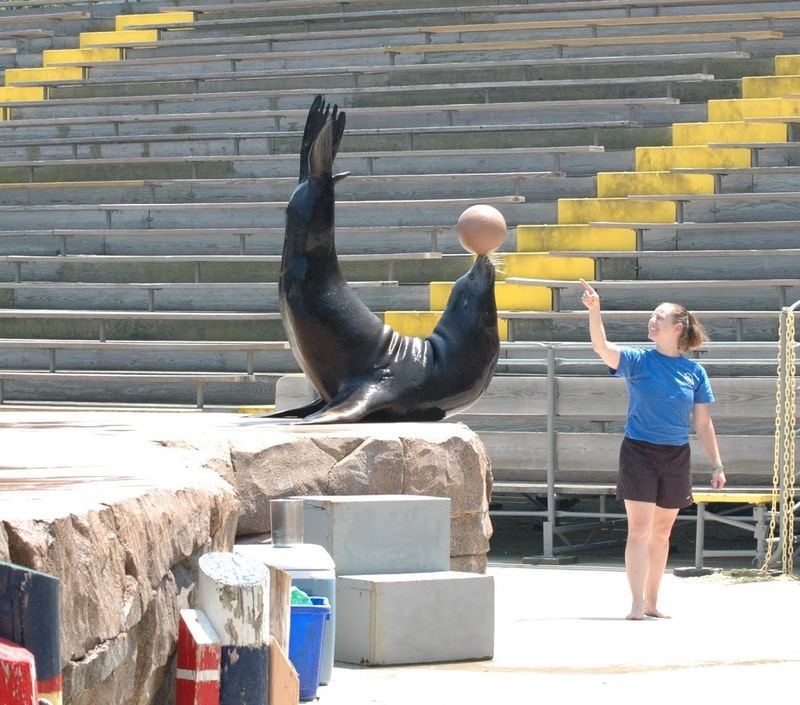 The zoos two well trained California sea lions did a great job of entertaining the audience. They look like they really enjoy showing off and we really enjoyed watching them. 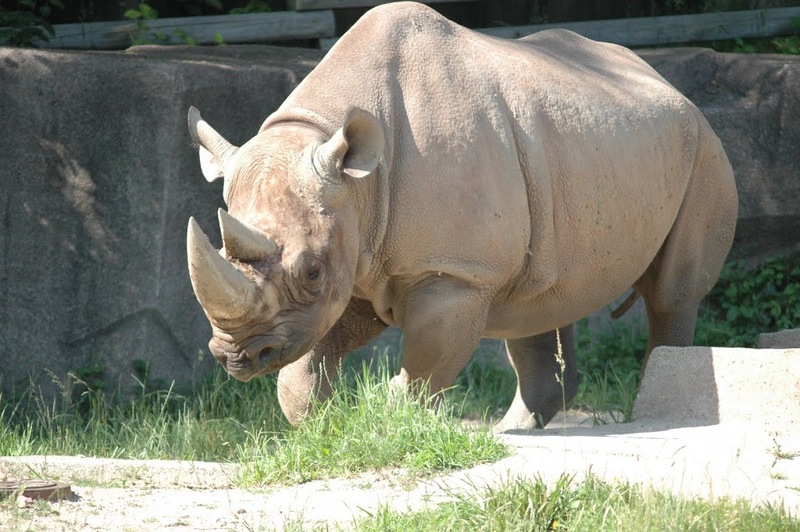 It is amazing to see just how many behaviors these animals can learn and perform. After the show we grabbed a cold drink and then continued on to the reptile, fish and small mammal exhibits. These are all inside and, again, the buildings were crowded. From there we went on to the bears and big cats. The bears were being lazy on this warm day. Every one of them, except a polar bear, was sleeping and didn’t seem inclined to move around for us. The cats were up and about though and we got some good pictures of them. 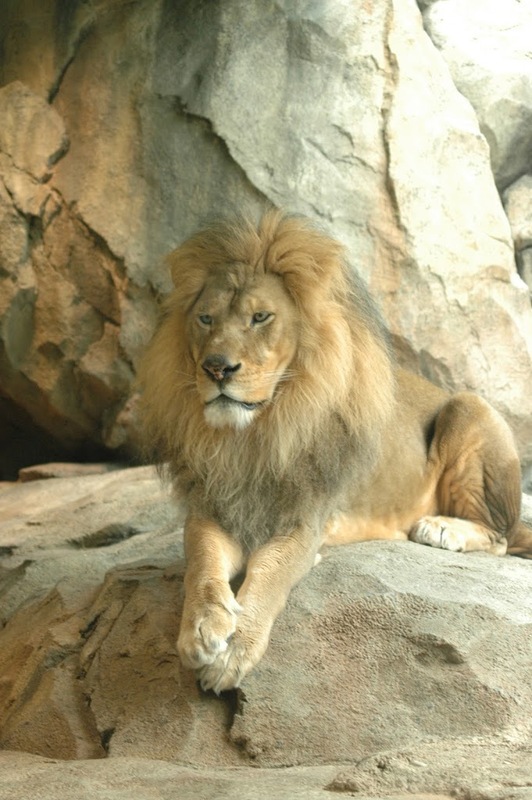 The big cats are Georgia’s favorite animals so we spent some time with them. 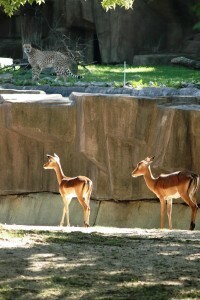 Besides the lions and tigers, the zoo has some beautiful cheetahs, jaguars and leopards. 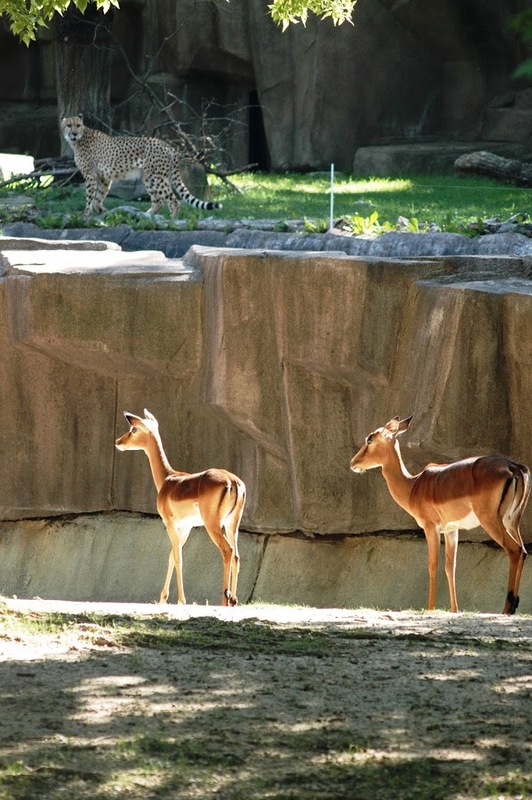 The way this zoo places many of the enclosures allows for scenes like this one of a cheetah and the gazelles that are his natural prey. 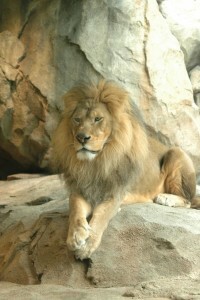 There is more to see at the Milwaukee zoo than I can write about in a blog post. We saw the animals of Australia, skipped the family farm, saw many large hoofed animals including North American and African species. Deer antelope and giraffes are all well represented. We finished off our day at the zoo with the pachyderms. The hippos, rhinos and elephants are some of my own favorites to watch. Why is it that the ride home after an outing always seems longer than the ride there? We got back late in the evening after another great day out.